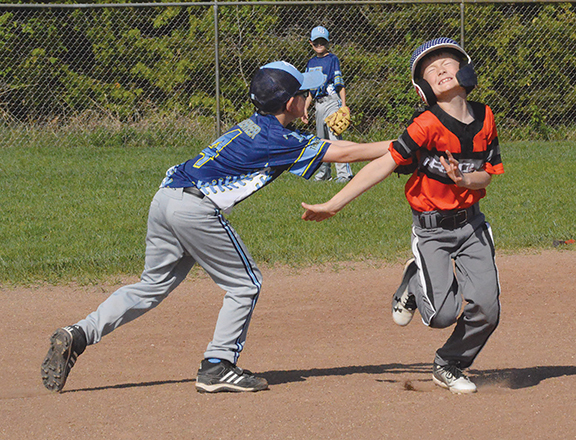 News File Photo Thunder Bay Blockheads player Kadyn Vanderveer, left, tags out an Ogemaw Orioles runner during a youth baseball tournament. The Alpena High School hockey team gave local fans a lot to cheer about this season. From the offensive exploits of Kyle VanDusen and Colby Plowman, to the stellar goaltending of Cooper Black, to the solid defensive play of Owen Limback, the Wildcats made the most of their talent on the way to a 23-win season that included wins over ranked teams, a Big North Conference title, and a regional championship. The Wildcats’ success on the ice delighted fans, but the groundwork for that success was years in the making, built on the hard work players put in playing travel hockey. By the time they suited up as varsity players, they were no strangers to success. 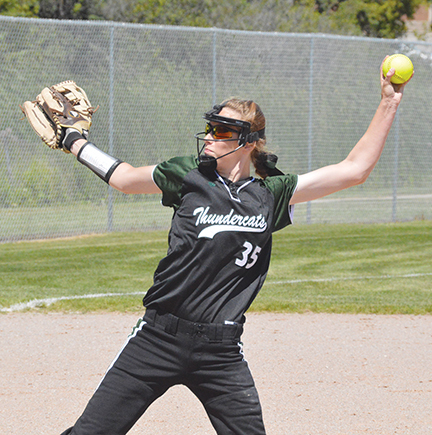 News File Photo Alpena ThunderCats pitcher Lilly Lewis throws during Alpena’s annual Thunderstruck Tournament. In recent years, the Blockheads and ThunderCats have been two of the area’s most successful travel programs, offering players a chance to challenge themselves and improve while providing a pipeline to Alpena’s successful varsity programs. Not every athlete participates in travel sports, but a successful youth travel program provides athletes a chance to test themselves against a better class of competition and it provides an important pipeline for the high school varsity programs those athletes aspire to one day play for. There’s still progress to be made in creating and maintaining travel program opportunities, but the success of local programs like the Alpena ThunderCats, the Thunder Bay Blockheads and Thunder Bay Soccer Association travel teams among others keep Alpena sports moving forward and help Alpena stand out as more than just a dot on a map. What does a successful travel program look like? Ideally, it’s one that provides kids at least one team for every age group and has strong leadership at its foundation. When Tim Storch was announced as Alpena’s varsity boys and girls soccer coach in 2011, he found a youth program in disarray. Many of the youth soccer teams barely practiced, and some of the youth coaches didn’t have much experience coaching the game. As a result, Alpena’s teams were a hodgepodge of players, some of whom lacked basic soccer skills. 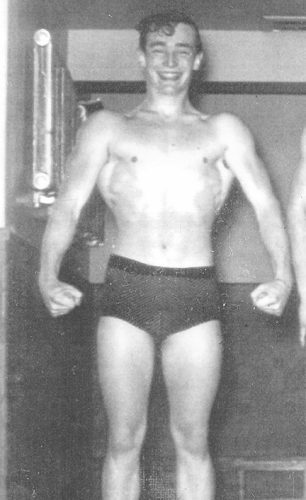 Fluctuating registration numbers often necessitated clumping kids in large age groups, so it wasn’t uncommon for an Alpena youngsters to play against kids from Petoskey who are years older than them, and have no realistic shot at winning. Such disparities can hinder player development, in some ways, but it’s better than the alternative: having no travel team at all. Since Storch’s arrival, participation in the TBSA has improved as the organization doubled down on its efforts to build Alpena soccer from the ground up. 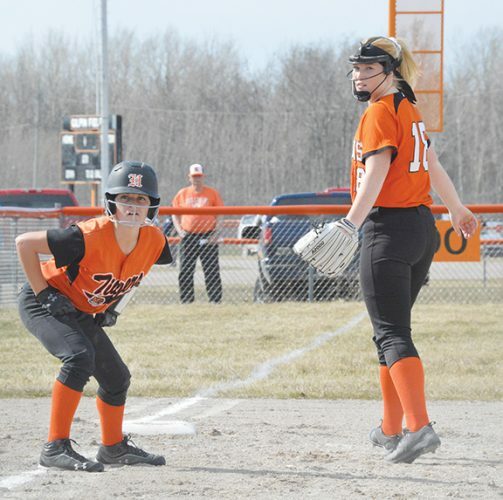 “With my encouragement and hard work of the TBSA board and the coaches, we embraced the concept that for the high school to get better, the youth has to get better,” Storch said. The TBSA has seen steady numbers of overall players and in those playing travel soccer. During the 2016 spring season, 282 players were involved in recreational soccer and 69 played travel soccer. The next spring, more than 300 played recreational soccer and 78 played travel soccer. Last spring, those numbers stood at 299 and 75, respectively. The numbers have also been steady for the fall season and, last fall, the TBSA had nearly 100 players playing travel soccer. Playing travel sports isn’t always easy. Budding travel programs often struggle initially against more established programs. But, win or lose, it allows athletes of all talent levels to hone their skills against competition they might not otherwise see. In the Traverse Bay Area Youth Soccer (TBAYS) organization, for example, players are playing at least a dozen games per season (for fall and spring seasons) against good competition. In the past, certain Traverse City-area youth teams have played against defending national champions in their age group, offering a chance to show players just how hard they have to work to compete at a high level. Storch knew Alpena faced that kind of challenge when he took over Alpena’s varsity program, and he said so after a particularly bad boys soccer loss to Traverse City Central in 2011. Storch saw Alpena’s success in other sports due to the strength of its youth programs and wanted soccer to reach that level. It’s taken some time, but a commitment to improving youth soccer and expanding the travel program has had a positive trickle-up effect on the high school teams, where the talent gap and technical gap between Alpena and its Big North Conference rivals has gradually narrowed. Sometimes, the success of a travel team is all about being in the right place at the right time. When the Thunder Bay Wrecks youth hockey program began in the mid-2000s, the program had upwards of 50 kids, with full rosters at the squirt, PeeWee and bantam levels. Limback’s team, which he began coaching when the team’s players were 9 and 10 years old, initially struggled against established programs. In one of the Wrecks’ first games, the team got routed by double digits against Marquette. But the initial struggles eventually paved the way for success. The chemistry that Alpena’s varsity players made look so effortless this season was built during those early years with the Wrecks. In 2013, Limback’s PeeWee team, which included Limback, VanDusen, Black, Plowman and Alex Cosbitt, among others, won a playoff title, in addition to regular season championships. Two years later, at the bantam level, many of those same players were on a team that won a district final and made an appearance at the state finals. The Wrecks’ success at multiple levels created a template to build up Alpena’s youth hockey program. But that success came to a sudden halt. When Limback returned to coach Alpena’s varsity team in 2017, the Wrecks program all but vanished, and the pool of athletes has since dwindled. Limback said one of the most important elements of a successful travel program is having someone who’s willing to lead it. Strong leadership has been at the heart of the success of the ThunderCats softball and Blockheads baseball programs. The ThunderCats program has five travel teams of various age groups, and prospective coaches go through an extensive interview process before they get chosen to coach. That attention to detail has made the ThunderCats program a consistent winner in various tournaments, provided a talented group of players to the high school team, and has helped local players get noticed by college coaches. In the last five years, nearly a dozen ThunderCat alumni have gone on to the college ranks. While places like Traverse City may have bigger travel programs and a bigger pool of athletes to funnel toward high school teams, Alpena has had success in its own right. This year’s senior class, in particular, has highlighted the benefits of playing on travel teams. Alpena senior Aidan Day was named the Big North Conference’s MVP for the boys soccer season. The Alpena softball team has won 16 Big North titles since the inception of the conference in 1997. Alpena’s hockey team, led by several seniors, finished the season undefeated on the way to a conference title, and Black was named to the Michigan High School Hockey Coaches Association’s Dream Team. Playing on a travel team doesn’t automatically guarantee an athlete a spot on a varsity roster when they reach high school. But coaches say athletes who play on travel teams take their respective sports more seriously and are committed to offseason training once they reach high school, in part because travel sports show them how hard they need to work to be successful. Despite that success, there’s no question most teams are fighting a constant battle against dwindling numbers. In 2010, Alpena High’s enrollment exceeded 1,400 students. Last fall, that number was just a touch under 1,200. Dwindling numbers have a trickle-down effect for youth programs and a lean class of youth players can mean mixed results for some high school teams. For longstanding programs like baseball and softball, retooling every season isn’t as difficult as it is for up-and-coming programs like soccer. While the soccer program has made strides in recent years in terms of numbers and talent, Alpena is still building to a point where the loss of a talented senior class can be offset by the players coming behind it. A shrinking pool of athletes is something all Alpena teams are faced with and there’s not always a ready-made solution to fix the problem. For the most part, coaches say the number of local travel sports programs currently offered seems appropriate for the area. But travel programs are always looking to expand where they can to provide opportunities for players in Alpena and the surrounding area. The Blockheads stand out as one example of recent successful expansion. The program was created after the 2013 merger of Alpena Huron Shores Little League and Alpena Babe Ruth, and community members saw the need for a travel baseball program. The Blockheads began play in 2014 with limited age groups and have since expanded to include more, with more expansion planned in the future. 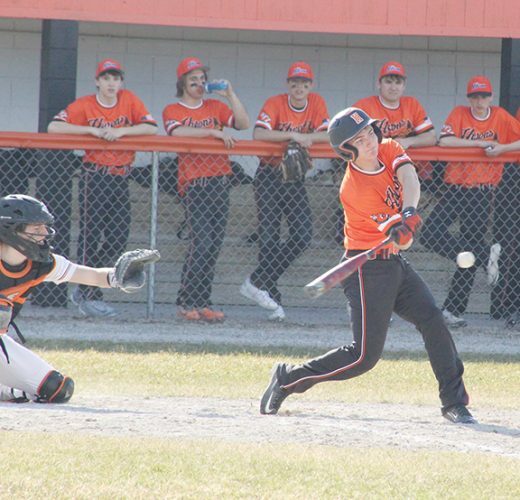 It’s paid off immensely for local ball players, who have won numerous spring and summer tournaments, been leaders on their local house league teams, and whose earliest members are now playing on Alpena’s varsity and JV programs. Efforts like that have allowed Alpena to make good strides at the various levels of sports in recent years and officials hope continued efforts to provide opportunities and expand where possible will bring some of the city’s travel sports programs up to a satisfactory level.